I took a break from reading over the holidays. There was family time and baking and lots of tv series and movie binge watching. I missed it, but with everything else there simply wasn't time. As the holidays wound down, I was glad to realize that I had Out of the Ordinary, part of the Apart from the Crowd series by Jen Turano to read. I have read the earlier books in the series, but certainly you don't need to have read them. I loved catching up a bit and learning more about some of the characters that I had met in the earlier stories. 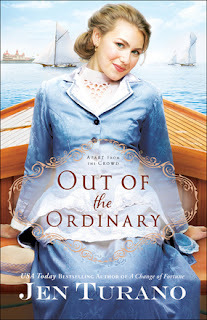 This Regency romance did not disappoint. It was full of quirky characters and mysterious situations. There were those that held the standards of society as the norm and those that eschewed it (or perhaps were oblivious to it) at every turn. There was the development of a friendship that evolved to be more, almost without recognition by those involved. There was revelation of secrets and healing through sharing and conversation. I think that hanging out with Harrison, Asher, Permilia, and Gertrude would be fun. If you enjoy period fiction, or just a good story, I recommend this book (and the others in this series too). Working as a paid companion may be quite commonplace, but Miss Gertrude Cadwalader's eccentric employer makes her job unpredictable, to say the least. She finds herself carrying out an array of highly unusual tasks, including wearing peculiar outfits and returning items the woman pilfered. But when the wealthy Mrs. Sinclair catches Gertrude sneaking around the Sinclair yacht with some of the missing items in her possession, she immediately jumps to the wrong conclusion. Shipping magnate Harrison Sinclair is caught in the middle of a misunderstanding between his mother and Gertrude, but he can't help coming to his friend's defense. Even as he hopes their friendship might become something more, Harrison is unprepared for the outlandish escapades that seem to follow the lovely, anything-but-ordinary Gertrude at every turn. Jen Turano is the USA Today bestselling author of nine books and lives in a suburb of Denver, Colorado. Visit her website at www.jenturano.com.